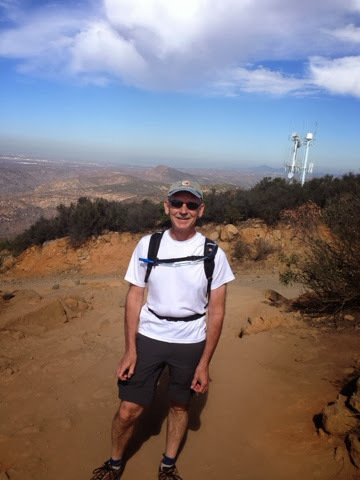 In planning out my last week here in the San Diego area I wanted to stay on the exercise track as much as I can as when I start on the road again I don't seem to get as much exercise that I would like. Also later this week we are expecting rain that will impact my outdoor plans and I will look for inside things to do. 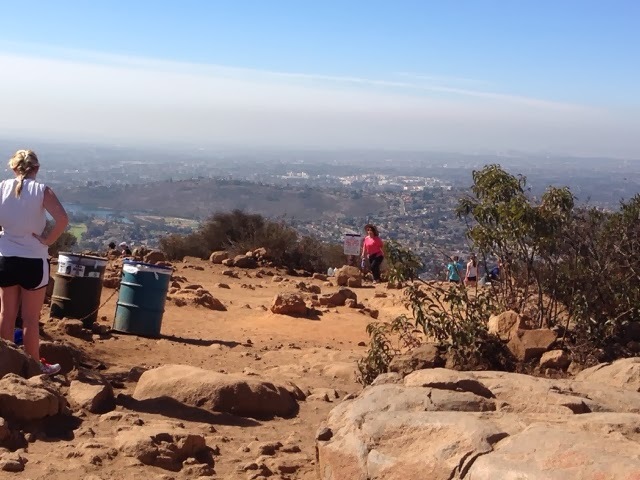 Checking out things to do I decided on Cowles Mountain. 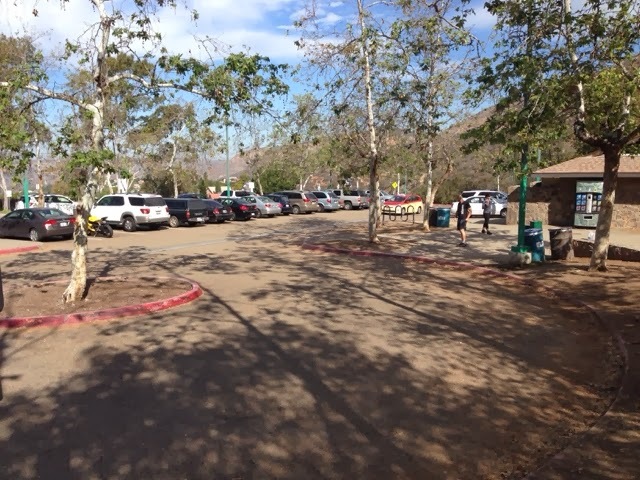 A good 3 mile round trip hike with good elevation change of 950+ ft.
A 20 minute ride brought me to this parking lot that was full and approaching it for a quarter mile in all direction every side street parking was full. I lucked out pulling into the parking lot. Someone was just pulling out. There is no shade on this mountain and it was a nice sunny day and 72 degrees. There were people of all shapes and sizes, many with dogs in tow. I could not believe the numbers of people climbing up and down. 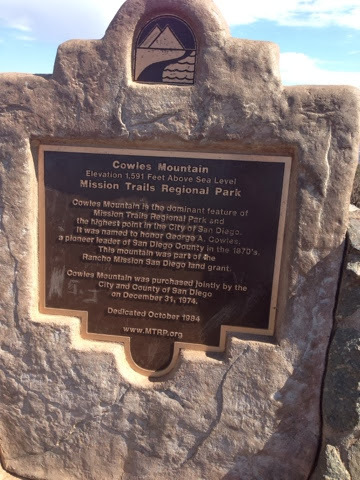 I headed to Cowles Summit, but there were at least 3 other major trails up the mountain and other destinations. 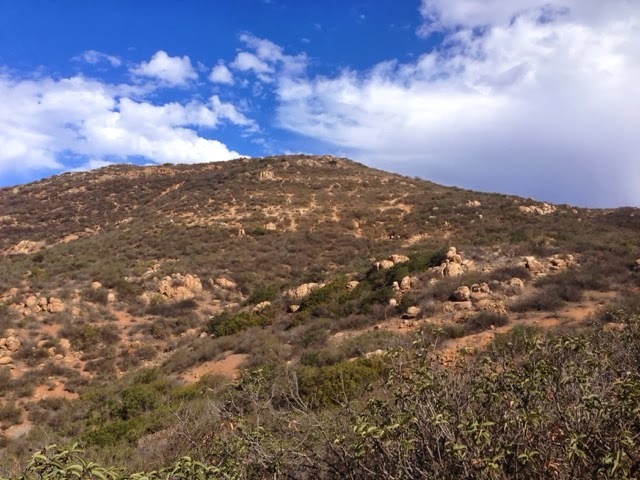 At just about this location in the picture below when a woman coming down the mountain about 30 ft away screamed and I saw a snake move off the trail. She came down and told me about her encounter. 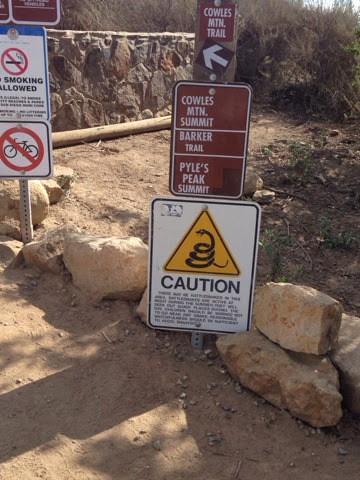 It was hard to believe with as many people on the trail that a snake would be in the area. I guess it could have been a rattle snake but I didn't see it close enough to know. 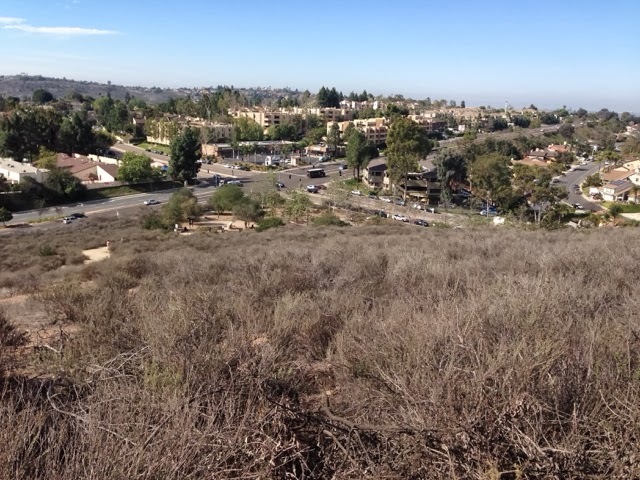 Next a picture in direction of where I parked and way off in the distance is the city of San Diego. 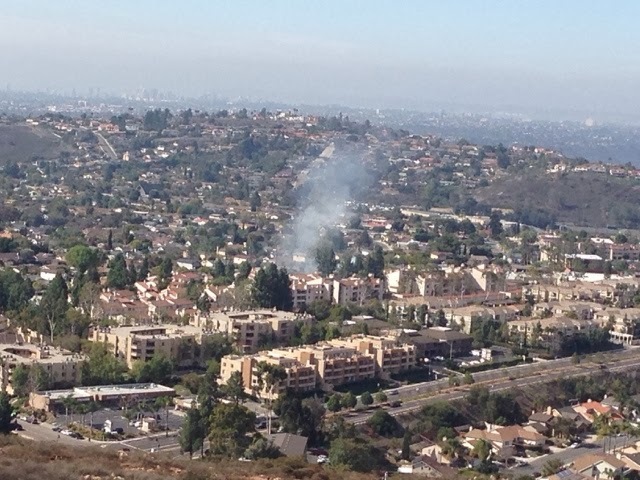 Now looking off to the same direction there is smoke showing. Not black at all so it gave me the impression it was an outside fire. 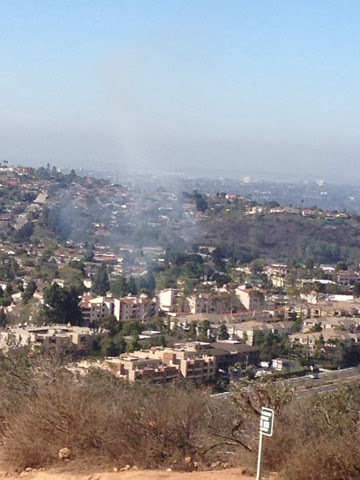 Also the smoke went up and down that also supported an outside fire. I hiked a bit more and took this picture. Now sirens could be heard from responding apparatus. This is my first working fire I have seen on my trip. Just after I left the Phoenix area last week they had a large fire with explosions in an industrial building. There is the blue sky. Still a long way to go to get to the top. Some people ran up others down and even a few ran in both directions. Many huffed spuffed their way up. Most you could tell hike this mountain on a regular basis for the cardio exercise. This mountain is the highest spot in San Duego and has a wonderful 360 view. Here is the marker at the top. 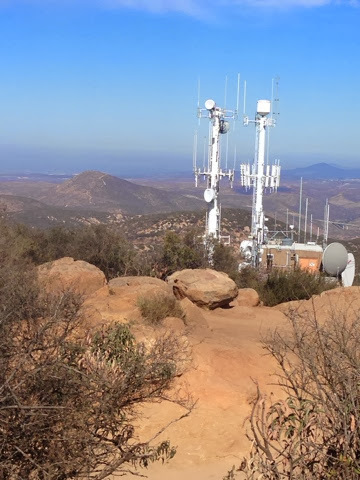 The peak is a bit higher than the antennas on the adjacent knoll. There is a good area on top to sit and catch your breath. 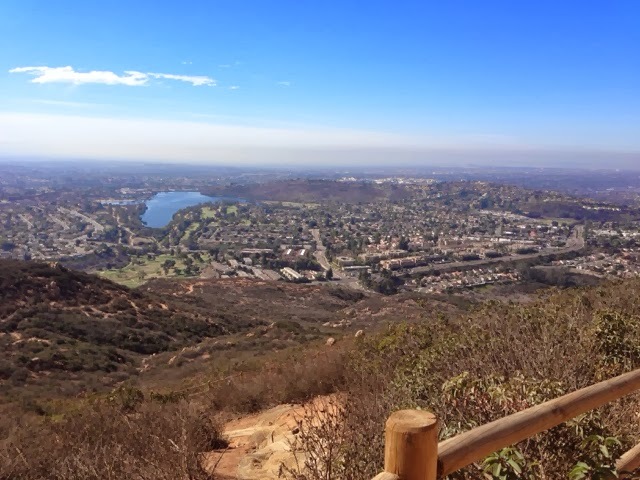 I met a man and woman who live in the area that gave me some ideas on other hikes in the area that I may like to try. He moved out here from Minnesota in 1973 and never thought of going back. 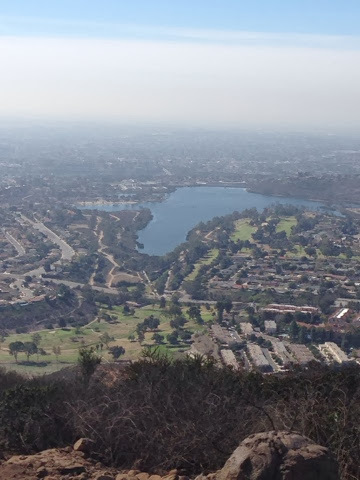 A zoom into the reservoir below. I got my inspiration for a hike tomorrow. Bigger, harder, and better! 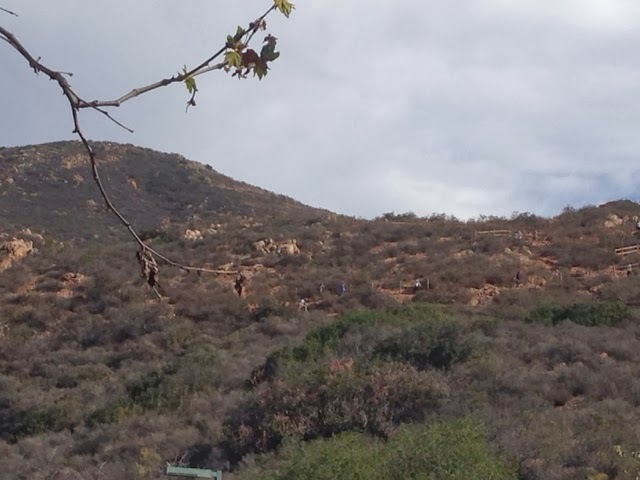 The tip came from the couple I met, but what tipped the scales on the one I want to hike was a woman who was talking to a young couple that she needed more practice on this mountain before she felt she would be ready for the one I plan to try tomorrow. I think I'm ready. Tuesday's weather is still expected to be good with highs inland where the hike will be will be around 70. Wednesday and Thursday there is now a chance of rain showers. Friday is calling for steady rain in the afternoon into evening and continuing into Saturday with heavy rain and even possible thunder. This afternoon I worked on a few small items that needed attending to on the camper.